In the decade since cloud computing became mainstream, it’s captured the hearts and minds of developers and enterprises everywhere. But for most IT organizations, cloud is still but a glimmer of what it could be—or what it should be. Today, we’re excited to share our vision for Cloud Services Platform, an integrated family of cloud services that lets you increase speed and reliability, improve security and governance and build once to run anywhere, across GCP and on-premise environments. With Cloud Services Platform, we bring the benefits of the cloud to you, no matter where you deploy your IT infrastructure today—or tomorrow. Cloud Services Platform is technologically and architecturally aligned with the joint hybrid cloud products we've been developing and bringing to market with our partner, Cisco, with whom we have been collaborating closely. Our joint solution, Cisco Hybrid Cloud Platform for Google Cloud, will be generally available next month and is now certified to be consistent with Kubernetes Engine, enabling GCP out of the box. Today, let’s take a look at aspects of the Cloud Services Platform, and how it lays a foundation for a fully realized cloud infrastructure. Last year, we took a step toward helping organizations move from reactive IT management to proactive service operations—the idea of managing at a higher layer of the stack, enabling greater application awareness and control. In collaboration with several industry partners, we announced Istio, an open-source service mesh that gives operators the controls they need to manage microservices at scale. We are excited to say that open-source Istio will move to version 1.0 shortly, making it ready for production deployments. Service discovery and intelligent traffic management—Managed Istio surfaces all the services running in your cluster and manages network traffic between them. Using application-level load balancing and sophisticated traffic routing for container and VM workloads, it also provides health checks, plus canary and blue/green deployments, enabling fault tolerant applications with circuit breaking and timeouts. Secure, authenticated communications—Managed Istio offers segmentation and granular policy for endpoints, compliance and detecting anomalous behavior, and traffic encryption by default using mTLS. Monitoring and management—Understand and troubleshoot the system of services running across Managed Istio, including integration with Stackdriver, our suite of monitoring and management tools. It's still early days, but we are very excited about Istio and Managed Istio, foundational technologies that will drive the use of containers and microservices, while helping to make your environment much more manageable, scalable and available. A great path to well-managed applications is undoubtedly containers and microservices, and having a common Kubernetes management layer can help get you there that much faster. Four years ago, we released Kubernetes, and the resulting Kubernetes Engine managed service is battle-tested and growing by leaps and bounds: In 2017 Kubernetes Engine core-hours grew 9X year over year. Now, with GKE On-Prem, you can begin to modernize existing applications on-premise, without necessarily moving to the cloud. You gain control of your journey to the cloud at your own pace. When it comes to managing clusters at scale, it’s imperative to have the right security controls in place and ensure your policies can be easily managed and enforced. 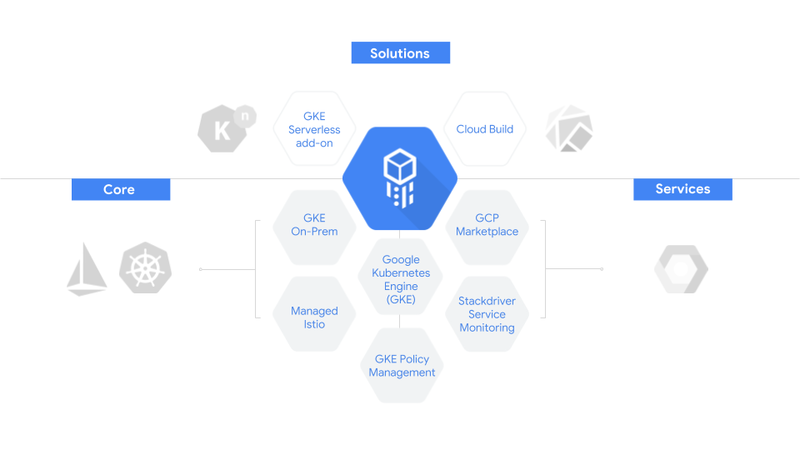 Today, we’re pleased to announce GKE Policy Management which delivers centralized capabilities that make it far easier for administrators to configure Kubernetes (wherever it may be running). With GKE Policy Management, Kubernetes administrators create a single source of truth for their policies that automatically syncs with any enrolled cluster. GKE Policy Management supports policies stored as definitions in a repository, and can also use your existing Google Cloud IAM policies to make it simple to secure your clusters. GKE Policy Management is coming soon to alpha; sign up here to express interest. Service graph: A real-time bird’s-eye visualization of the entire environment—see all your microservices, how they communicate, and their dependencies. Service level objective (SLO) monitoring: Monitor and alert in the same customer-centric, low-toil manner as Google Site Reliability Engineers (SRE) do for our own services. Service dashboard: All your signals for a given service are in a single place so that you can debug faster and easier than ever before and lower your mean-time-to-resolution (MTTR). Stackdriver Service Monitoring is designed for workloads running on opinionated Istio infrastructure, as well as App Engine. Microservices provide a simple, compelling way for organizations to accelerate moving workloads to the cloud, serving as a path towards a larger cloud strategy. Istio enables service discovery, connection and management for microservices. But as soon as those services are needed for internal groups, partners or developers outside of the enterprise, they quickly cross the line and become APIs. Just as organizations need services management for microservices, they need API management for their APIs. Apigee API Management complements Istio with the robust features of Google Cloud's Apigee API management platform, Apigee Edge, by extending API management natively into the microservices stack. Apigee Edge features include API usage, access, productization, catalog and discovery, plus a developer portal to create a smooth experience for developers and increase API consumption. GKE serverless add-on lets you run serverless workloads on Kubernetes Engine with a one-step deploy. You can go from source to containers amazingly fast, auto-scale your stateless container-based workloads, and even scale down to zero. Sign up for an early preview for the GKE serverless add-on here. Knative (pronounced kay-nay-tiv), open-source serverless components from the same technology that enables the GKE serverless add-on. Knative lets you create modern, container-based and cloud-native applications by providing building blocks you need to build and deploy container-based serverless applications anywhere on Kubernetes. Cloud Build is a fully-managed Continuous Integration/Continuous Delivery (CI/CD) platform that lets you build, test, and deploy software quickly, at scale. Now, with Cloud Services Platform, we’re excited to bring the full potential of the cloud to you, wherever your workloads may be. For more on Cloud Services Platform, you can read about how it relates to serverless computing.